(dwōrf'izm), Negative of pejorative connotations of this word may render it offensive in some contexts. Obsolete term for a condition or a group of conditions in which the height of the person while standing is below the third percentile. Usually termed short stature. /dwarf·ism/ (dworf´izm) the state of being a dwarf. the abnormal underdevelopment of the body, characterized predominantly by extreme shortness of stature, although the condition is associated with numerous other defects and may involve varying degrees of mental retardation. Dwarfism has multiple causes, including genetic defects, endocrine dysfunction involving either the pituitary or the thyroid gland, chronic diseases such as rickets, renal failure, intestinal malabsorption defects, and psychosocial stress, as in the maternal deprivation syndrome. See also dwarf. Nanosomia Excessively short stature–eg, ≤ 152 cm/5 ft in ♂ and ≤ 145 cm/4'9” in ♀; 35% of dwarfism is familial, 25% is idiopathic, 10% is due to pituitary failure, 10% to hypothyroidism, 10% to congenital gonadal aplasia, and the rest, etc; proper classification of the more than 55 congenital conditions associated with dwarfism allows determination of the likelihood of conceiving a similarly afflicted child. See Bird-headed dwarfism, Pituitary dwarfism, Psychosocial dwarfism, Silver-Russell dwarfism, Thanatophoric dwarfism. 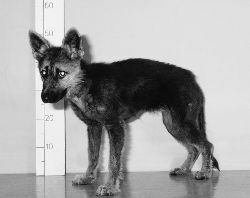 A condition in which the standing height of the subject is below the third percentile. Abnormal shortness of stature. This may be of genetic origin as in ACHONDROPLASIA, DOWN'S SYNDROME, Trisomy 18, TURNER'S SYNDROME and Bloom's syndrome or it may result from glandular defects such as pituitary growth hormone deficiency, primary thyroid deficiency (CRETINISM), precocious puberty or adrenal gland insufficiency. It also results from various metabolic disorders such as HURLER'S SYNDROME, TAY-SACH'S DISEASE, NIEMANN-PICK DISEASE and GAUCHER'S DISEASE. a form of body malfunction in which the adult individual does not reach the normal height and may sometimes have other abnormalities. Such conditions can be due to a deficiency of GROWTH HORMONE secreted by the anterior pituitary, or to cartilage abnormalities due to genetical defects (see ACHONDROPLASIA). Compare GIGANTISM. Short stature. When caused by inadequate amounts of growth hormone (as opposed to late growth spurt or genetics), hGH deficiency results in abnormally slow growth and short stature with normal proportions. n deficient growth and development leading to small stature and often skeletal deformity. It may be associated with ovarian agenesis, pituitary insufficiency, mongolism, progeria, rickets, renal disease, dietary deficiency, achondroplasia, cleidocranial dysostosis, osteogenesis imperfecta, microcephaly, hydrocephaly, sexual precocity, and delayed adolescence.